We had to say goodbye to one of our sweet dogs – Gwyn. 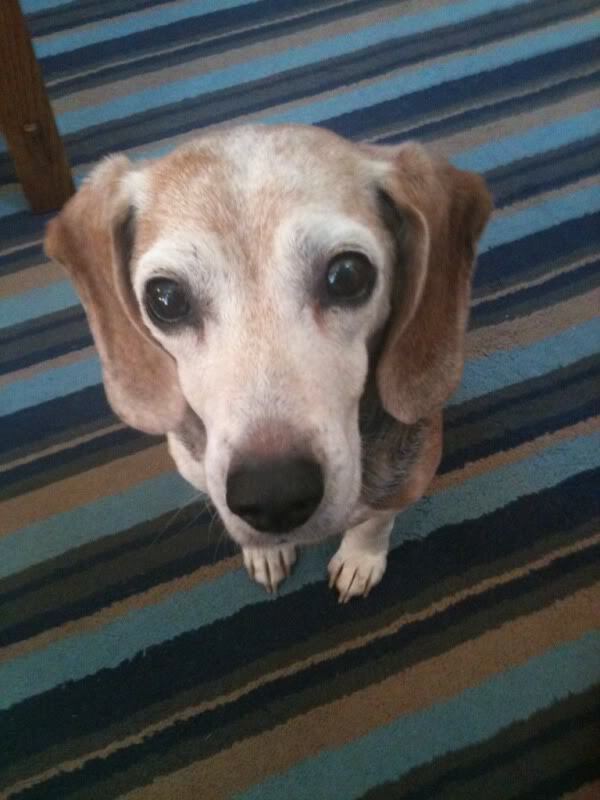 She is a beagle and I rescued her almost 11 yrs ago in Athens, GA from a rescue organization. She was the sweetest and calmest dog I have ever met. She could speak volumes with her big ole eyes. She lost her battle with kidney disease and it broke all of our hearts to have to say goodbye. I needed a stress reliever so on Tuesday (the day we lost her) I took off on my bike and did about 11.5 miles in about 1 hour. I was hot, sweaty, and tired which was just what i needed. My schedule is a little off, but who cares, I’m still moving and getting outside. Me and my other half are off the rest of the week, so we took advantage and got the whole family out for a bike ride this morning. It’s a little humid but not horrible. We made it around the 10k route in about 40 min. That’s not too bad considering we have one pulling a trailer with our youngest and our big boy is riding (and complaining even though he can do it) his own bike. So here is my sweet girl, complete with her big eyes and she probably wanted something. So the current plan is to swing my bell tomorrow after my chiropractor and nutritionist appointment and then just work around my house. I’m sure there will be some swimming this weekend too. Then the next week will be pretty easy and nothing fancy. Hope everyone has a great holiday week and stay safe out in the heat.